A common sight at railway stations throughout Ireland, including Ballinrobe, when a member of a family was emigrating. 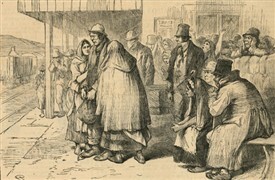 The first emigrant of a family often sent money home for the next family member to follow and so on. Parents often felt that they would never see a son or daughter again and departures must have been a heartbreaking event. This was where the title 'wake trains' evolved. The Ballinrobe and Claremorris Light Railway Co. Ltd was formed in 1884. However, there had been a number of proposals and schemes from the 1840s, including one from the Connaught Junction Railway and the South Mayo Railway. The 1884 formation was with the aid of a Baronial Guarantee and had the backing of the contractor Robert Worthington. Some of the founder members were Canon Ulick Burke P.P., Claremorris, Peter Bartley, Draper, Ballinrobe, Patrick J. Murphy, Merchant and Thomas McTigue, Shopkeeper. The first meeting of the company took place in the offices of Patrick Daly, solicitor Ballinrobe in Dec. 1884. Later committee members were Canon Ronayne P.P. of Ballinrobe, Alex Martin of Curramore House and Hermon Fitzpatrick, Hollymount. Some years passed until an agreement was made with the Midland Great Western Railway to operate the line in 1890. The company was absorbed into the Great Southern Railways c 1925. During the war years fuel became scarce and the passenger service was suspended in Feb of 1947 with 'Goods' ceasing in March. Both services were restored a few months later. Construction went ahead with the line opening in Nov 1892. The contract to build was awarded to the "Worthington Company” with Ballinrobe railway station serving as a branch line from Claremorris and ran in a south-westerly direction to Ballinrobe. Hollymount was the only ther station on the line. During construction the bog at Derrymore had to be drained and an Iron Bridge spanning the Robe River built. There was also a three arched bridge constructed at Caltra. "The Bat" was the first train to Ballinrobe, driven by Owen Malone. Ballinrobe was to become the largest livestock forwarding station in the west which was a large source of revenue to the local area. Other sources of income came from passengers and goods like tyres, bicycles, Guinness, manure, cement, coal, pollard, flour, bran, masonry, agricultural machinery, beet pulp, timber, newspapers and fish traffic (particularly eels) and other goods. With a large Army garrison in Ballinrobe the station was regularly used for the movement of troops and supplies, with specials trains running from the North Wall in Dublin bringing 300 tons of the fuel for their use on the last day of each month. Town deliveries to various wholesalers, businesses and shops were by a horse drawn, flat-bedded float with some of the drivers being Jim Monaghan, Davy Murphy, Stephen Burke and Michael Coyne. Ballinrobe train service contributed to an increase in tourists in the area and one important guest was the Prince of Wales, later King George V of England in June 1912 who stayed at Ashford Castle in Cong, only six miles away (The prince was so enthralled with the area that he extended his stay from 2 days to 1 month). There were regular arrivals and departures of tourists, with many fishermen coming to fish on Lough Mask and Carra. This service played a major role in the economic and social development of Ballinrobe with a total of 16 employed on the branch at the time of its closure. One of the Station Masters was Bill Clinton, and there was a clerk Tom Maye, and railwaymen Michael Hughes, Stephen Burke and Tom Veldon. Other staff included P. O'Brien, ganger, Gerry Dwyer, Inspector, and Hugh & Pat Caulfield. The Station closed altogether on 1 January 1959. The last train was operated by drivers Jack Monaghan and fireman Hughie Dawson, with Michael Higgins as guard. Graham McCartney mentions Henry William Blackmore. Is this the same Henry who married 1925 Annie Feenah? Annie's mother was Georgina Benson from another railway family from Sligo. Editor: Can anybody help out with this query please? To mark the 60th anniversary of the closure of Ballinrobe Railway, there will be an exhibition (and possibly talks) on the Railway as part of the Ballinrobe festival in July 2019. Details will be confirmed closer to the time as they're available. In the 1911 Census a Patrick McDonagh aged 19 from Sligo was a "Railway Clerk" and lodging in the Morris home in Abbey Street along with a John O'Sullivan aged 27 from Dublin working as a "Teacher of Golf"! I recently discovered my Ballinrobe great grandfather was the same Terence O'Brien. His son Terence Francis came to NYC in 1920's after Independence, where he had my father Terence Patrick and where I was born. Would be interested in discussing further. Marian I met your Dad on a flying visit Oct 2013, nice to meet you! Both my Great Great Grandfather (Henry William Blackmore) and my Great Grandfather (William Henry Blackmore) worked as first firemen, then loco drivers in Athboy (9 Town Parks) and Ballinrobe (6 Cornmarket). The latter was eventually station master near Chapelizod/Island Bridge in Dublin for MGW Railways in Ireland. (I have a book on MGW Railways by Ernie Shepherd and a very old photo of GG Grampa's loco at Ballinrobe station pre 1900's). If anyone is interested contact me....I would love some old photos of either Athboy or Ballinrobe. My late father, Tom Fahey of Ballydaff worked as a plate-layer on the Claremorris-Hollymount section of this line from about 1953 up to its closure. Others to work this section was Jim Grier from Brookhill. My mother was gatekeeper at Ballydaff. Thanks so much for the very informative history! I also came across the film footage of the Ballinrobe station on YouTube a couple of years ago having had no previous knowledge that there was ever a rail line that existed in the town. More importantly, your story has provided a very interesting family connection. My grandfather's uncle was Peter Bartley, one of the founding members of the rail line. I wasn't aware of him before this or that any Bartley's were ever even shopkeepers in Ballinrobe. My aunt confirmed this for me recently. 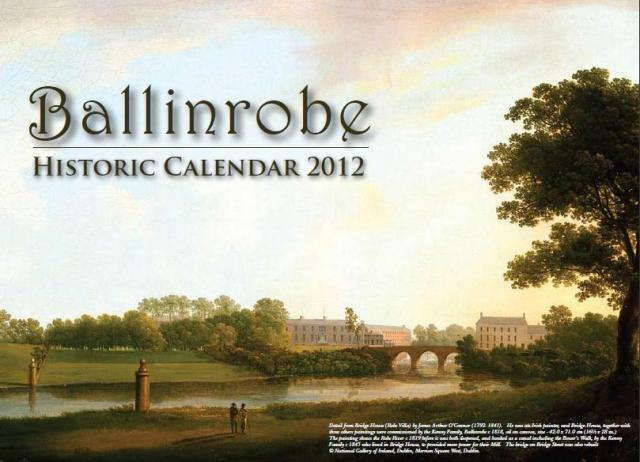 I've since researched and found out more about him and some of his contributions to Ballinrobe. Thanks again for all the wonderful information that you provide here! Surprised no one remembers the Weldons, so far. 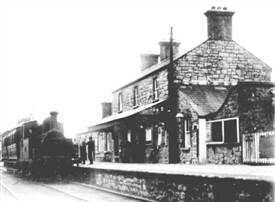 The railway cottage is still there, its the first crossing out of the station. My grandfather worked on the railway on the level crossing just outside Claremorris and it was in the cottage by the level crossing where I grew up before leaving in 1934/35. His name was Tom Weldon, related to the Father of Brinslet Mc Namara (Valley of the Squinting Windows fame). There was a short video clip of Ballinrobe railway station up on youtube in the last number of months but has since been removed. It was a black and white clip and there were 2 or 3 men lifting what looked like crates and moving them around. Does anyone know where I might find this clip as a relative of mine was in it. Thanks, Alan H.
Think we could be somehow related because my grandfather, Patrick, worked on this railway and retired to Roscommon where he worked on a gate crossing. My grandfather had a brother called Terry/Terence . My greatgrandfather Terence O'Brien was the foreman on the building of the railway line from Claremorris to Ballinrobe. Most of his sons worked in CIE afterwards at one time or another. John Louis was a train driver, Tom O'Brien was a truck driver and they also managed the gates at the level crossing at Cregmore. Pake O'Brien worked on the railway line with his father until he retired to Roscommon. I notice under employees at the Ballinrobe Railroad Station it is noted "One of the Station Masters was Bill Clinton". My grandfather, father and I are named Thomas J. O'Brien. It has been my understanding that my grandfather was also Station Master at Ballinrobe; however, I'm not sure during what time period. I believe my father had three brothers who were ordained Columban Missionary priests and a sister who was a nun. My father emmigrated to the US sometime around 1930. Is there any way to determine if my grandfather was Station Master at Ballinrobe during the 1930's?